Yes, this was amazing. 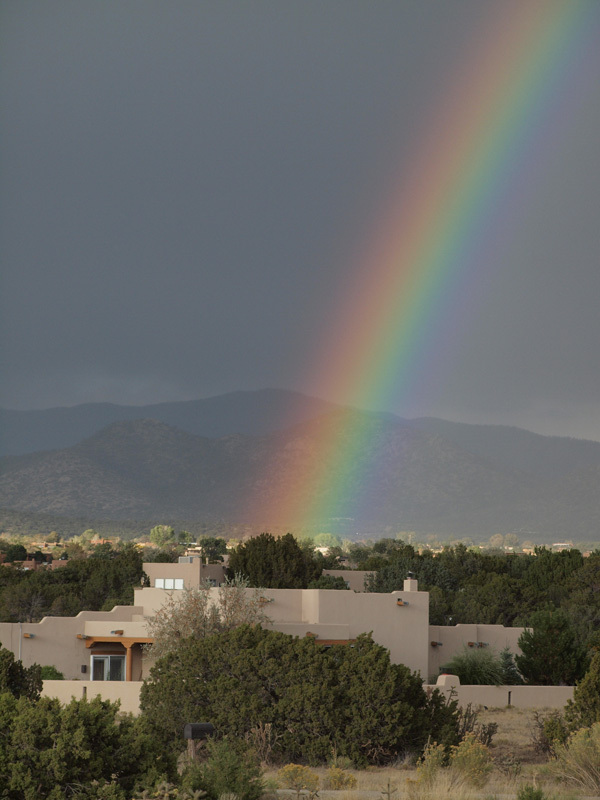 And more amazing was that it was a full rainbow – brilliant all along its arc across my neighborhood. Even with the very wide angle of the iPad camera, I could not capture the whole thing in a single shot, so I took several – which I will try to stitch together in Photoshop, and share if I can make a success of it. The photo above, I shot with my DSLR. Of course, I ran right over there and found a huge pot of gold. In the pot of gold was a word . . . I don’t know if there is a greater treasure than the ability to live simply – even if you live a very complicated life. To observe just one thing at a time. To feel just one thing at a time. To think about just one thing at a time. To process just one thing at a time. Think about this for a moment . . .
Only a hundred years ago, most of us lived in rural communities, and many of us on farms and ranches that were quite isolated from the rest of the world. Every few months or so, a traveling salesman would come along and bring us the only news we got from outside our own small town. He often was invited to sit a spell and tell us all about it. We maybe picked up 5-10 “information bits” – in exchange for a cold drink or a warm supper. And then, we had a few months to ponder, process, and figure how these new thoughts might effect us, before the next “news” came along. That was pretty much how information got around for the the first 200 thousand years or so of homo sapiens history – word of mouth. There was no information highway – just an old dirt road. And then came the past hundred years. Back in the late 70′s, when I was teaching a high school sociology class, I asked my students to count the number of information bits they picked up in just one day. Encounters with other people counted, advertisements of all kinds counted, TV counted . . . etc. The totals were in the thousands – in one day. And that was before the coming of the digital age. Now, we are constantly bombarded with info bits when our senses are open for business, and even our sleep time is used trying to process them. It’s no wonder we feel so nuts. But what to do about it? Here are three ideas . . .
#1. Give up on the idea of processing and retaining it all, or even most of it. We are the same biological critters we were a hundred years ago. In other words, our hard drives and CPUs have not been updated to deal with all this. Our operating system is still Version 1.0, for heaven sakes. We haven’t got a chance. It’s sort of like trying to surf the web on the first Macintosh. #2. Forgive yourself for forgetting. So you walk in the other room and have no idea why you went in there. That’s not you losing your mind. It’s your mind’s attempt to divide one thing from another in some way, because it can’t cope with the confetti storm of info bits it is expected to gather and sort. So, you have a different shoe on each foot or a different earring in each ear. You aren’t the only one. Sit yourself down and count your fingers and toes. If you come up with 10 each, you are still processing ok.
Now, stand up and try to take one thing at a time. You can’t have it all and you don’t want it all. So, choose an info bit that really has meaning for you, and dive into it. Immerse yourself in it, and process it then and there, so it doesn’t become part of your mental flotsam and jetsam. If it is a creative idea, go ahead and try it – right then. Yes, you do have time because you are not going to pay attention to those other million things. If you want to know more about something, research it – right then. The internet makes research an easy thing. You can learn more than you want to know about something in minutes. But be careful of all the other info bits that coax you to go into “other rooms” because you will certainly forget why you went in there. Sounds like bliss to me. 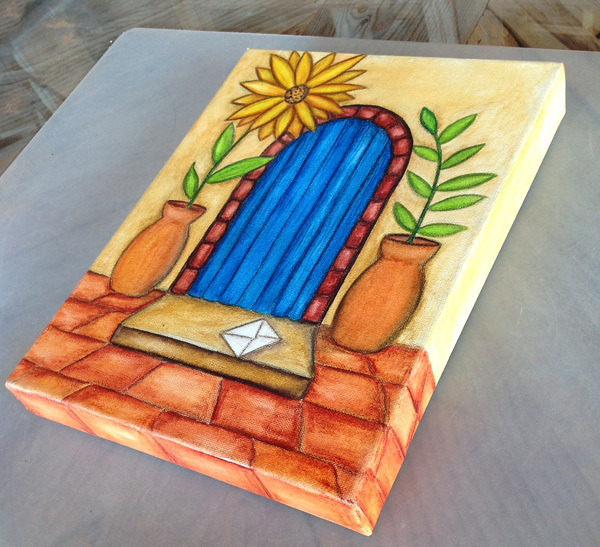 This entry was posted in Just Thinkin on September 29, 2012 by jessica. The Last One In Line . . .
Why Am I Always the Last One In Line? Well. actually, I know why I am always the last one in line at the supermarket and such places. I run in for just a bunch of green onions – so I don’t need a basket. Then, all of a sudden, my arms are full of many things, and my right pinky is trying not to let go of a bag of All Natural Cheetos, and – I need a basket! By the time I am pushing that basket along the floor with my foot because it is too heavy to carry, and my arms are full again, I realize I need a cart. You know the rest of that story. So, anyone who sees me and my shopping cart in a line would not choose to get behind me. But there are other reasons too. I have warned everyone NEVER to to get behind me in a line. My line will ALWAYS be the one you wish you were not in. Inevitably, the register will run out of tape or change, the person just ahead of me will have decided to pay with the jar of pennies she has been saving since 1940, or the cashier will have just reconsidered her career choices and decided then and there to run off and go to beauty school. One time at the post office, just as I had worked my way to the first place in line, the clerk got arrested before my very eyes, for unpaid parking violations – by three guys in suits – handcuffs and all. So, I understand why I am always the last one in those lines. The whole thing has taught me great lessons in patience, actually. 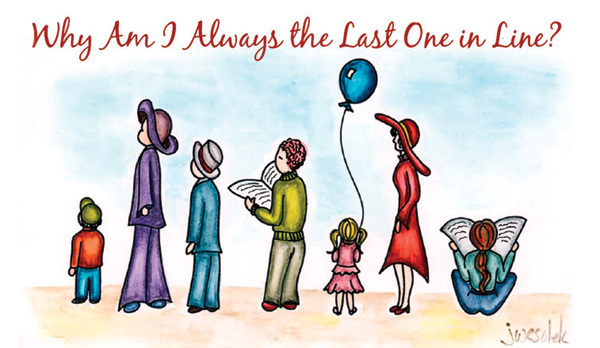 And I have met some interesting people and heard their life stories while waiting patiently in line – only the people in front of me, of course, since there is never anyone behind me. But, here is something I don’t understand . . .
Why Am I Always the Last One in My Own Line? For some reason, when we were children, we were taught to put everyone else’s needs before our own. And most of us do that as a habit. I hold a restaurant door open for a person wearing a name tag, not noticing the tour bus at the curb disgorging another 30 people with name tags, all hungry and eager to get into that restaurant. Never hold the door for a person wearing a name tag. There is never just one. I even say “Excuse me” to my cat, for heaven’s sake, when she is in MY way! We think of this behavior as self-less.. We are such good people because we put ourselves last. But think about that word for a moment. Self-less? I don’t want to be less of my self. I don’t even think that sounds healthy. Not even as healthy as All Natural Cheetos. I don’t want to be self-ish either. What is that? Almost, but not quite yourself? Like 5-ish or 6-ish? It seems that being true to your self would be the best thing – affording your self the same respect and consideration you would give to someone else. If you need to get into that Ladies room, don’t tell the woman and her six children they can go ahead of you. If you need a nap after an arduous day, don’t volunteer to help the neighbors weed their back forty. You can be a loving and giving person and still take care of your “self”. The other evening, my dear husband, one of only two men left on earth who do not cook, asked me what I was thinking about for dinner. I stepped right in front of him in the “Needs” line. He was surprised, but he got himself a yogurt and disappeared into the house. I got to meditate in the garden. It felt wonderful, and right. So, I’m going to do more of that kind of thing. I like this new spot somewhere in the middle of my own line – not first, but not last either. It feels good to be among the important folks. But, I still say “Excuse me” to my cat. This entry was posted in Just Thinkin on September 9, 2012 by jessica. The Curse of Cuteness . . . I mentioned before that the blogs I love to read are those that talk about an aritst’s process – the thinking that goes into creating. I hope you find that kind of thing interesting too, because I am about to share some process with you. Firstly, after 35 years of trying, I have managed to find a way to paint with water media on canvas. That is an exciting thing which I will revisit at another time. Today I want to talk about cute. Those who know me well, know that I struggle with cuteness in my “serious” art. In fact, I can’t seem to do much “serious” art because a touch of the Disney-esque always seems to get in there – even when I paint in a hyper realistic style (not the case here, obviously). But I have never been a real starving artist, struggling to release the passions of my soul. At least, I don’t think I have. I have written a few folk songs about lost love, but I never created any paintings about it. 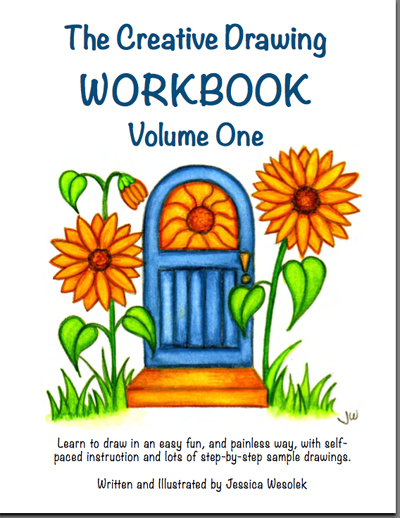 Creative Drawing Workbook . . .
which had a large cuteness factor. So, I wanted to make the painting more serious, and also try out a new idea I had about adding a 3D element – a lock on the door. Therefore, the door in the painting has no knob. 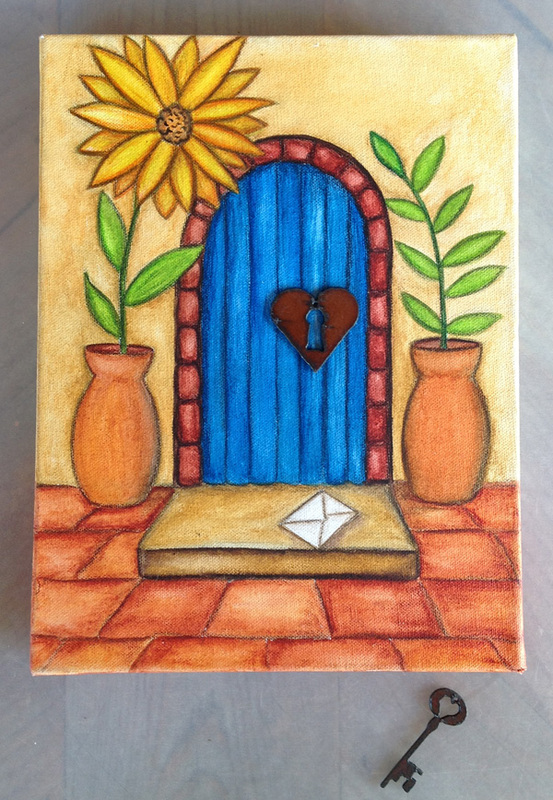 As I am going along, a new title hits me – “The Door That Would Not Open”. Now, there’s a serious title for you, right? Anyway, I think Surrealists love titles because they either help explain what the heck is going on in the painting, or they add another level of strangeness. René Magritte gave titles to his paintings that had nothing at all to do with the subject, or actually opposed the subject – like “This Is Not A Pipe”, when surely it was. Titles usually come to me somewhere in the process of painting. I have been known to shamelessly change the whole direction of a painting in honor of a good title. I added an envelope on the porch step. Now, we have a whole new level of what it means that this door won’t open. Now, we’re getting serious. But, the painting is done on a gallery canvas, so I continued around the edges just for fun . . .
Now, we have 3D – even though it is an illusion, and we are back to seriously cute. So, what about that lock idea . . . I would hang the key from a small hook I would screw into the bottom of the canvas. Then, what would the title be? “High Hopes”, maybe? Obviously, this version is happier (and cuter). It makes you wonder, but not TOO much. It has a future that might turn out a variety of ways. It could have a happy ending. “The Door That Would Not Open” is much darker, the future of the story is pretty much a foregone conclusion, and an opportunity has been missed. It makes the thing a whole lot more serious. There is something about the depth of that which appeals to me. So, here I sit, with hardware in hand, and can’t decide which way to go. If I attach that lock and paint the canvas black behind it, I am locked into that version. No going back. I would love to have your opinion. I’m not saying I will go with the popular vote. I would just love to ponder your input. 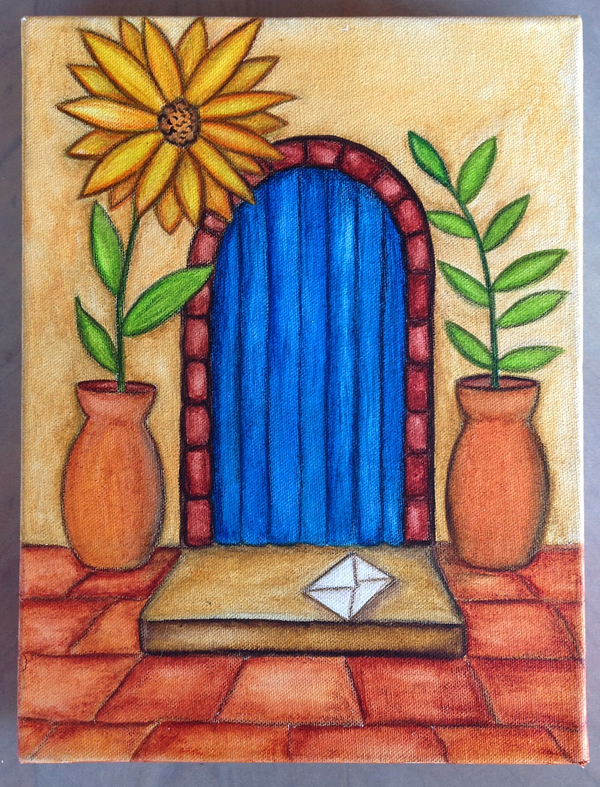 This entry was posted in Just Thinkin, Watercolor on September 3, 2012 by jessica.